Receive the matrix by email, Neo. Ideate and plan what experimentation tactic works for your hypothesis. How should I use the matrix? Find your executional tactics to validate new marketing tactics and business ideas. There are no failed experiments. Only unexpected outcomes. Plan the tactics with your team and execute on them. Let's learn! The Experiment Design Matrix maps out 16 different ways to experiment. 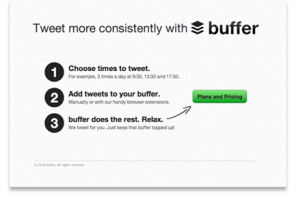 One of the most famous cases is Buffer's landing page, simply explaining the product and showing the pricing. The goal is to get people to buy your product, even if it is not ready yet. 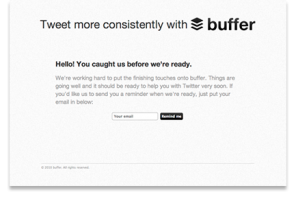 The final page in the flow is not an apology for an unfinished product, but an opportunity to built a waiting list and connect with new, potential leads. 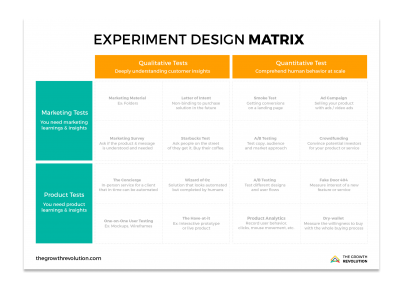 Ideate on your own experiments with the Experiment Design Matrix. Choose which tactics are relevant for you. If you are looking to do an experiment, you need an action plan. Find out what tactics work for you and think on how you can use them for your specific testing.